With the advent of complete-season DVD sets and episodes on-demand at the push of a button or the click of a link, binge-watching TV shows has become the cultural norm, making a season of a TV program kind of like a super-sized movie. Considering its self-contained story that will be swapped out for a different narrative next year, HBO's new show, True Detective, feels particularly like an 8-hour movie rather than 8 discrete episodes. It helps that the entire season had the same writer, novelist Nic Pizzolatto, and the same director, Cary Joji Fukunaga (Sin Nombre, Jane Eyre), which gives the show a palpable consistency, especially when the creators decide to shake things up over the course of their story. Matthew McConaughey and Woody Harrelson anchor this gut-wrenching manhunt drama that occupies a psychic terrain similar to David Fincher's Seven or the more recent Red Riding Trilogy but manages to cut its own unique path through the well-worn serial-killer subgenre. The two actors play investigators with the Louisiana State Police, trying to find the culprit behind the ritualistic murder of a young woman in 1995. 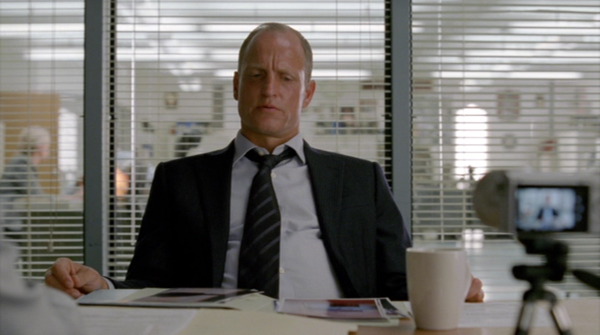 Pizzolatto sets up the difference between the two men immediately with their names. Harrelson is Martin Hart, who is primarily ruled by his emotions, while McConaughey is Rust Cohle, a self-described pessimist whose cold calculation and unwavering focus comes off like a more grumbly mumbly Sherlock Holmes. At the beginning of the series, Hart and Cohle* are being interviewed in 2012 by the State PD about this old murder case. Even though the bad guys were supposedly found back then, a recently dead body has been discovered, with similar ritualistic markings and artifacts on the scene. Maybe it's a copycat, and the cops conducting the new interviews (Michael Potts and Tory Kittles) like Rust Cohle for this new killing. It's hard to blame them, because with his wispy long hair, dead eyes, and unending stream of nihilistic monologues, McConaughey's Cohle puts out a real Frailty vibe, if you catch my drift. Marty Hart, meanwhile, is not exactly a boy scout either. His emotional nature means he can be boisterous and fun-loving, but he can also inflict serious damage if his emotions go the other way. Marty has a loving wife, Maggie (Michelle Monaghan), and two daughters, but feels the need to blow off a little steam with a court reporter named Lisa (Alexandra Daddario). When he finds out that Lisa has decided to date someone else, Marty explodes and beats the stuffing out of the guy. 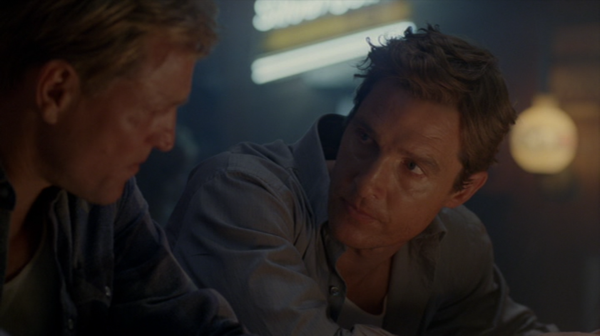 In many ways, the constant ideological friction between Cohle and Hart, and the philosophical dialogue that results from it, is more engaging than watching the machinations of them working their case. When True Detective takes a detour from those dread-soaked meditations and heads into more straight-ahead procedural territory, as it does with the fourth episode "Who Goes There," the series shifts gears with a vengeance. To track down a suspect, Cohle is forced to join back up with a meth-dealing motorcycle gang he had infiltrated as an undercover agent years ago. He finds himself helping the bikers with a stick-up that goes wrong in the middle of a housing project full of armed men who don't enjoy being ripped off. Fukunaga takes the opportunity to play out Cohle's frantic escape in an incredibly ambitious 7-minute single-take setpiece. The carefully built tension of the preceding episodes is allowed to just explode in this sequence, which then gives the whole narrative a new-found blast of energy that propels us through the era-hopping second half. 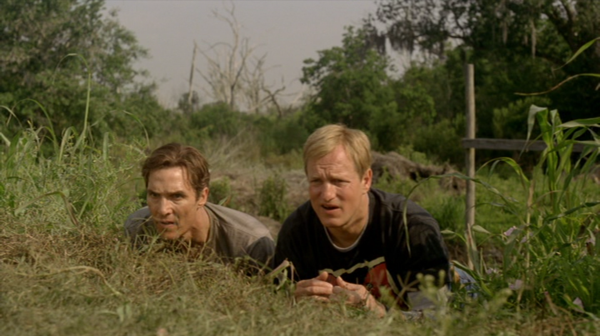 At the end of the day, True Detective is a top-notch drama. It manages to be constantly compelling, even when some of its storylines are not as fruitful as others. For instance, though Monaghan gives a full-blooded performance as Hart's wife Maggie, most of the scenes relating to the difficulties of her marriage can't help but feel like played-out filler. Those flaws notwithstanding, the series stands as a sustained piece of craftsmanship the likes of which has not really been seen on the small screen up to this point. The consistently atmospheric style created by Fukunaga and his crew, coupled with the thoughtful dialogue by Pizzolatto, and topped off by the strong but not show-offy lead characterizations by Harrelson and McConaughey, come together in a way that is truly greater than the sum of its parts. It will surely be a neat trick if they can keep it up in the coming years. *When you put their names together -- Hart and Cohle -- it sounds like a bad pun on "Heart and Soul," but a pun which suggests that maybe Cohle has "coal" where his soul should be. On the other hand, maybe it's just a twangy "Hot and Cold." True Detective is presented on 3 DVDs, with a few episode-specific bonuses on the first two discs and the remaining bulk on disc 3. The widecreen 1.78:1 transfer is strong for a standard-definition presentation. The blacks are inky, the colors are saturated, and the video compression is minimal. The SD image does come up lacking most often in wider shots, with the fine detail getting lost and some occasional aliasing cropping up. The main English Dolby 5.1 surround audio sounds excellent, with carefully crafted atmospheric effects in the rear channels and cleanly presented dialogue up front. T-Bone Burnett's moody score is also well-served. For other options, the disc offers French 5.1 and Spanish 2.0 audio, plus English, French, Spanish, Brazilian Portuguese, Chinese, and Thai subtitles. Audio commentaries for episodes 4 & 5 - An interesting set of chats. The first is with creator/writer Nic Pizzolatto and composer/music supervisor T-Bone Burnett, and the second features those two gentlemen plus producer Scott Stephens. Though the commentators do quite often sit silently watching the show they made, when they do talk, their conversations about the actors, the story, the atmosphere and the themes of the show are entertaining and enlightening. Making True Detective (15:01) - A pretty solid making-of featurette, with on-set footage and interview soundbites with the cast and creators. Inside The Episode (36:01 total) - As with many of HBO's shows, these eight little featurettes allow viewers to get a post-game wrap-up of the episode they just watched and to get a sense of what the show's creators had in mind when they did what they did. While none of these pieces are earth-shattering, it's useful if you just want to have someone talk you through what you just watched -- which might be something you need with this show. Deleted Scenes (9:56 total) - Two sizable clips, neither of which seem like actual scenes that would have made the show. Instead, these are just longer uninterrupted takes of material we glimpse incorporated into other sequences within the show. The first is an uncut version of the sermon given by Rev. Joel Theriot (Boardwalk Empire's Shea Whigham) in episode 3; the second is a montage of images of the Louisiana coast expanded from the version in episode 8. Up Close with Matthew McConaughey and Woody Harrelson (8:03 total) - Four short pieces that can be played separately or all together, where the two leads talk about working together on specific scenes. The last bit, which deals more generally with their frustrations with each other, seems to cut off just as it gets good and gossipy. Conversation with Nic Pizzolato and T-Bone Burnett (14:24) - A fascinating discussion that begins with the topic of Burnett's signature musical score and his evocative use of source music cues, then continues into a broader exploration of the characters and the story of the series. HBO once again delivers an ambitious drama that's addictively entertaining. Though much of the show is bleak, the emotional journey that the characters undertake is powerfully cathartic and manages to sneak some light into a genre which usually thrives on cynical darkness. So when's season 2 start? Highly Recommended.